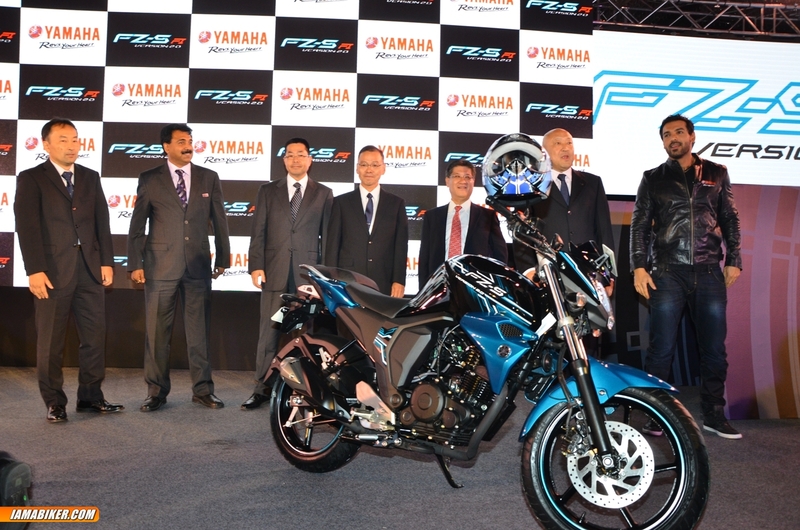 Yamaha India today launched 2 new models to the very successful FZ Series. The new models Yamaha FZ Version 2.0 and Yamaha FZ-S Version 2.0 are mounted with a newly designed air-cooled 149cc 4-stroke, SOHC, single-cylinder fuel-injected engine on a lightweight frame to realize the product concept of a “Sharpened & Power-packed New FZ.” The eagerly-anticipated launch took place today at J W Marriott Hotel, New Delhi as Bollywood heartthrob John Abraham unveiled the new models to public applause and delight. The new FZ Version 2.0 and FZ-S Version 2.0 will be available in the market beginning July 2014 at a price of 76,250/- for the FZ 2.0 version and at a price of 78,250/- for the FZ-S version. Colour options for the new Yamaha FZ 2.0 are Panther Black & Scorching Red and for the new Yamaha FZ-S 2.0 are Astral Blue, Moonwalk White, Cyber Green & Molten Orange. Building on the reputation, the new FZ Series models have been newly developed with Yamaha’s New Generation Engine Development Ideal — ‘Blue Core’ featuring improved performance in all areas, including fuel efficiency, acceleration and environmental friendliness. 1. New engine offering class-leading acceleration with 14% improvement in fuel economy and compliant with BS IV emission standards. 2. Fuel injection and light weight (lightest in 150cc class) to enhance engine performance. 3. Newly Designed Tandem Seat & Grab bar for good rider comfort. 4. Multi-function instrument panel featuring an “ECO Indicator” that lights up when the machine is ridden in an eco-friendly manner. 5. New front and rear suspension settings. 6. New Chassis-related changes for a light, agile ride. 7. New Front and Rear tires for improved handling stability.